The Great Wave off Kanagawa (神奈川沖浪裏) is one of the most well-known Japanese prints of all time. It’s also a great metaphor for better understanding the diverse nature of data visualization. Created around 1830 by Japanese artist Katsushika Hokusai (1760–1849), The Great Wave is a remarkable example of the ukiyo-e style, an expressive genre of woodblock printing that flourished in 17th-century Japan. Due to its widespread popularity, there’s hardly anyone who cannot immediately recognize the painting, but when it comes to its portrayed subject, the understanding is often not as clear. 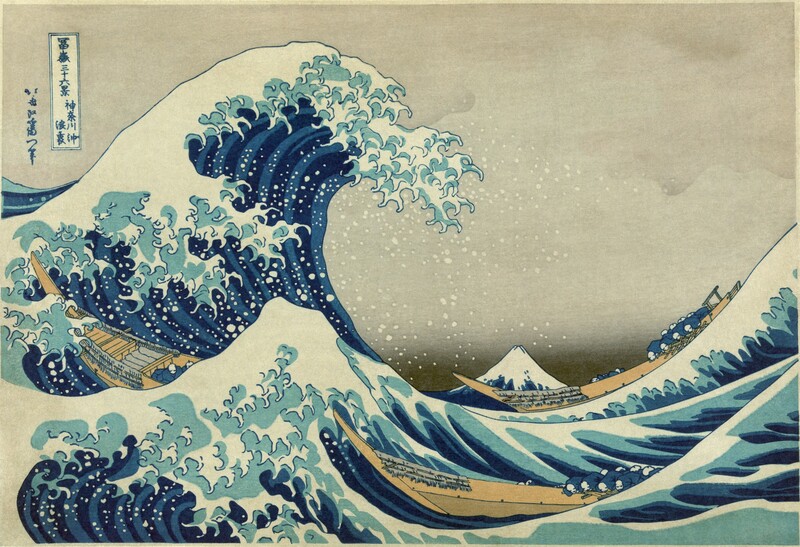 Due to Japan’s historical vulnerability to tsunamis — a word itself of Japanese origin (tsu “harbor” + nami “wave” 津波) — and the painting’s explicit title, some believe The Great Wave aims at depicting the mighty force of a tsunami, or perhaps the fishermen’s struggle with the sea. However, the main topic sits calmly in the foreground of the evoking seascape. The highest mountain in Japan and an important symbol of national identity, Mount Fuji (富士山) is the prime target of The Great Wave. Furthermore, and central to the analogy conveyed here, The Great Wave is part of an extended series of woodblock prints, entitled Thirty-six Views of Mount Fuji (富嶽三十六景). 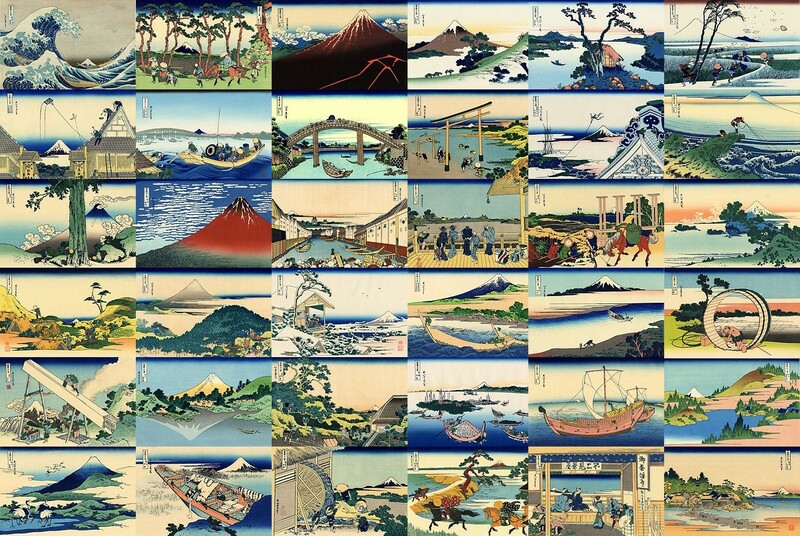 This broad collection of prints aims at depicting Mount Fuji from every possible angle or viewpoint, and during different seasons and times of the day. It is an awe-inspiring, widely comprehensive analysis of Mount Fuji, showing the imposing mountain as it is seen from the sea, the plain, the forest, the field, the village, the lake, the river, the beach. The analogy with data visualization is simple and I have used it occasionally at lectures: as Mount Fuji can be depicted from various angles and viewpoints, so can any data set or targeted subject. The chosen angle depends on the intended goal or question: how does Mount Fuji look in the Summer? How does it look from the village? It is a similar type of inquiry that drives many visualization projects in an effort to reveal some unfamiliar pattern or correlation in the data. At times projects might try to answer multiple questions by allowing users to freely explore and probe every facet of a given data set, as if we were provided with an immersive 3D-spinning exploration of Mount Fuji. But even those rich, interactive projects can hardly apprehend the entire scope of a single subject. Visualization, and parallel fields like painting and cartography, have since its early days been an illustration of the tangible world — an abstraction of the thing itself. And even though visualization has over time become a lens into the intangible, a cartography of the indiscernible, depicting structures that are invisible and undetected by the human eye, it still delivers only one of many possible models. This debate between model and object has been with us for thousands of years and it invariably takes us to philosopher Alfred Korzybski’s well-known expression, “the map is not the territory”. Korzybski’s statement triggers an age-old concern that applies equally to visualization, warning us against the disproportionate belief in the trustworthiness of certain maps, as the ultimate rendition of reality. A modern version of this map-territory conundrum can be witnessed in the devoted effort of creating the ultimate survey of the Internet. 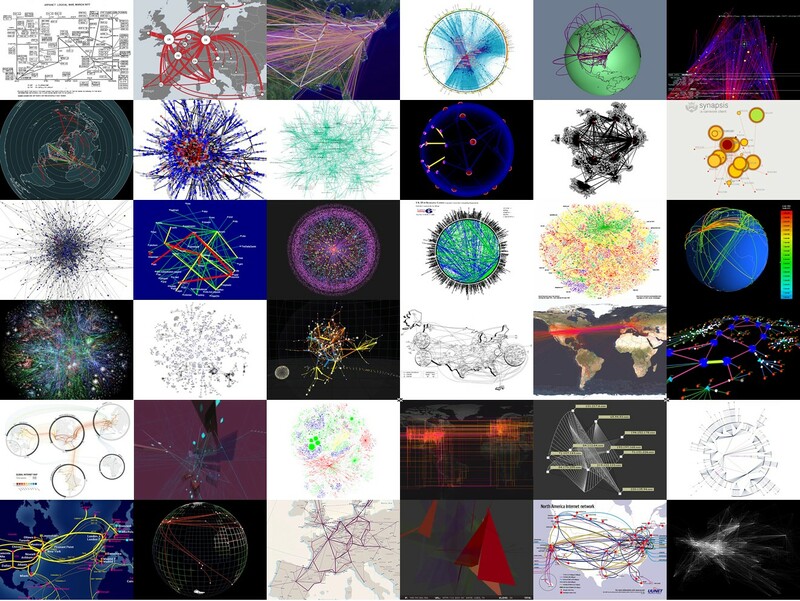 Resembling the sixteen century fiery pursuit for mapping the intriguing New World, the Internet has been a main target of visualization enthusiasts over the last two decades. Every so often, there’s an article on the media with a similar bold statement: “This is how the Internet looks like!”, claiming to have finally revealed the paramount chart of this enthralling, ever-expanding structure. Whenever this happens, it’s fair to believe some will take such a claim at face value. But of course this couldn’t be further from the truth. One of the many absorbing charts created by The Internet Mapping Project, an initiative started by Bell Labs in 1998, with the goal of tracing Internet topological data over a long period of time. 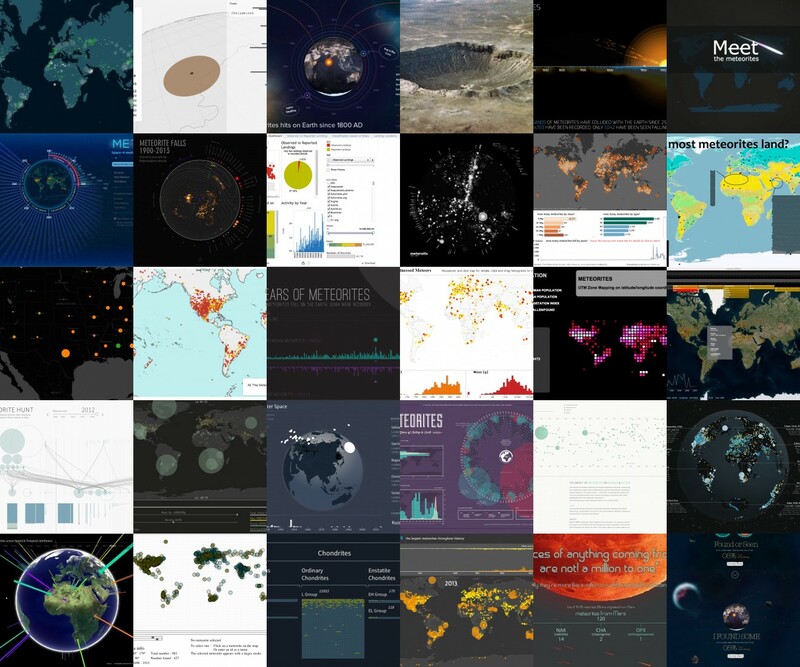 Another great example on the diversity of visualization can be witnessed in many of the challenges organized by Visualizing.org — a community of visualization aficionados built by GE and the Seed Media Group. Occasionally with a dedicated sponsor, challenges have a defined theme and a primary dataset (our Mount Fuji), and participants are asked to consider any visualization model that better portraits the subject. 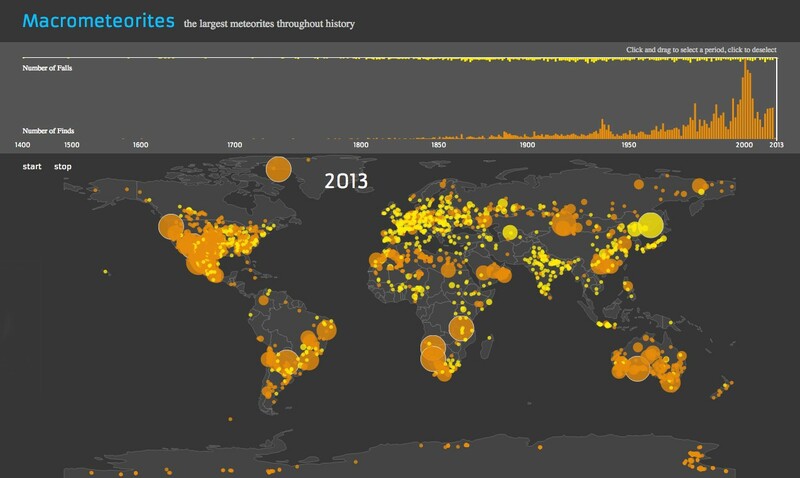 Take the example of the Visualizing Meteorites challenge, set forth in early 2013, which promoted a curious data set compiled by The Meteoritical Society that includes all recorded meteorites that have hit Earth since 2500 BC. A simple glance at the various submitted executions reveals the sheer assortment of approaches one can take by using the same data set, in this case, a long list of all known meteorite landings. Some of the visualizations focus on the volume of landings over time, others in its geographical distribution, others even, on both approaches simultaneously. Notice how the graphical methodologies are also quite varied, from the set of chosen colors to the selected map projection model. Compilation of 30 entries submitted to the Visualizing Meteorites challenge organized by Visualizing.org. The examples used here show us how any given topic can be interpreted in multiple ways, or as I would put it, should be deciphered in multiple ways. In a time where visualization tools are becoming increasingly popular and democratized, we should always be aware of the danger of tunnel vision and the overreliance on a single snapshot, as the only viewpoint on a given subject. Many of the inherent complexities of the modern world can hardly be understood through a single model — there are simply too many interdependent and interconnected variables. It is only by a collective set of diverse models and approaches that we can truly grasp its indiscernible facets.